I’m making good progress on my summer wardrobe. When I packed for this trip, I planned on bringing dozens of unfinished things to work on. As I started to edit out due to space constraints, all the quilting projects got left behind and I was left with a duffle bag full of clothing patterns and yardage. Perfect for building my summer wardrobe! I had cut out this Banksia top a little while ago. 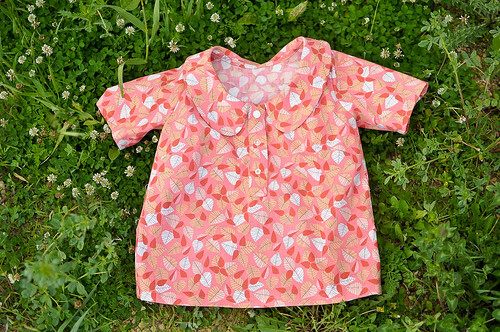 The adorable strawberry fabric by Lizzy just couldn’t be more cheery and sweet. I love that when you make your own clothing you get to choose the fabric that is going to put you into a good mood as soon as you pull it out of the closet. Some days, you choose those items because it matches your upbeat mood, other days, you hope the cheery vibe of the garment will rub off on you, literally. This is my first try using a Megan Nielsen pattern. I had not heard of her patterns until Angelune mentioned I might consider this line for their cute maternity options. It’s true, I have not seen such cute little tops and dresses for pregnant and nursing ladies. 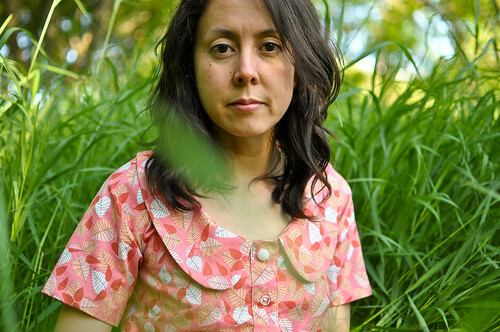 Luckily, there are also a few patterns in the line for those of us that are not expecting a bundle. 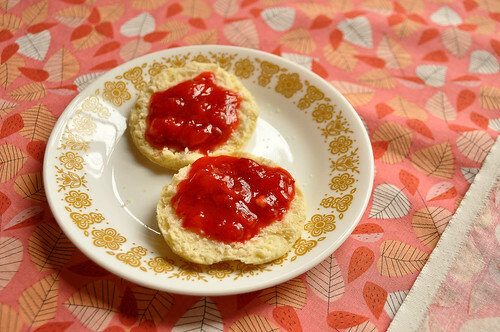 All of a sudden, it seemed like everyone on the internet was making the Banksia or Darling Ranges dress. We have had them at the workroom for a couple months and we’ve just put them in our online shop too. The packaging is charming, with a little velcro dot on the envelope to reseal it. (nice touch!) You get a nice little booklet of instructions that you can also make your own notes in. The day that I worked on this was extremely hot here, so I was a bit cranky and impatient. Not ideal sewing conditions, but I was determined to sew and tried to keep in mind that I was feeling slightly unreasonable. 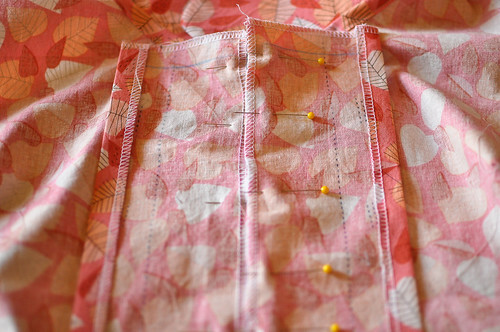 There are two ways to sew the placket. I chose to do the more complicated way (of course! ), so I had to read slowly, several times through the instructions. It wasn’t as complicated as it sounded, but often when you’re not sure the direction that something is going in, you have NO idea how you’re actually going to get there. Yes, even I feel this way! The top is fairly easy to put together. I found that the bust darts were not at all right for me, so I had to undo the side seams, stitch rip out the darts and extend them to make them a bit longer. After that the fit was so much better. I did have enough forethought to bring along a selection of buttons on this trip for a few projects. I had some good feedback on my button choices from my Instagram pals. Some of whom had the brilliant idea to use all different buttons. What a great idea! I got to use three different cute buttons to finish this off. I’m also a sucker for a Peter Pan collar and this one is nice and big! Some people have extended this pattern to make it into a dress and I think that would be pretty sweet. I’ll be making the Darling Ranges dress next. I’ve got the perfect Liberty fabric picked out for it. This is fabulous! It’s almost enough to tempt me into making clothes. Almost. Lisaleh recently posted..We Have a Winner! I love it! I love how you decided to use all three different buttons 🙂 I couldn’t pick a favorite in IG, they were all too pretty. 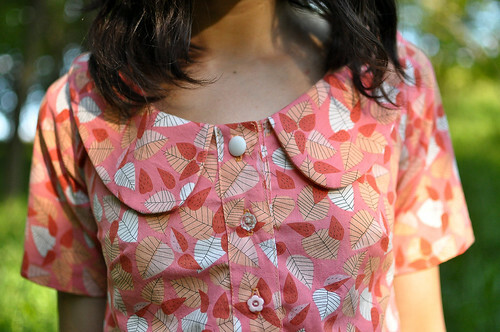 Love the top, the fabric, and the button choices. Well done. That is the most adorable top. I will definitely be buying that pattern!!!! So cute! Is the neck big enough to make it without actual buttonholes? I don’t have a sewing machine with a buttonhole attachment anymore, and I’m not that good at embroidering my own buttonholes. I was dying to see what button would win and I love how you picked all 3. Yay! 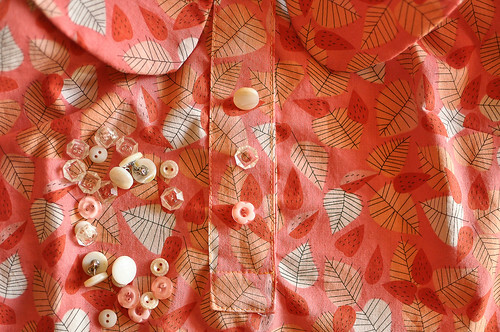 The top looks great with the mismatched buttons. I LOVE that top! I’d not heard of these patterns, off to check them out. And those mismatched buttons are fantastic! So glad you are back to blogging!! Love the new clothing, keep it coming! Also, did you make your duffle bag? What pattern? Gorgeous pattern. Gorgeous fabric. I’m in love with this blouse. Is this a pattern for a really experienced sewer?